This is a 9 drawer leather chest, that can be used for a number of things, but is perfect as a jewelry chest. It was made by Maitland Smith and is extremely heavy. The drawers are black lacquer on the inside, and brown leather with gold trim on the outside. It is signed on the inside of the top drawer. It measures 42" tall x 10" wide x 11" deep. It is in good condition with some wear to the leather. Absolutely beautiful sterling charger with openwork and figural cupids playing musical instruments on a 2" border. 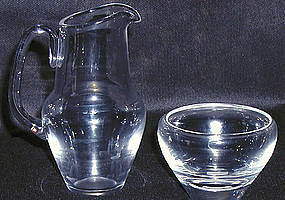 There is a vermeil wash over both sides of the surface. 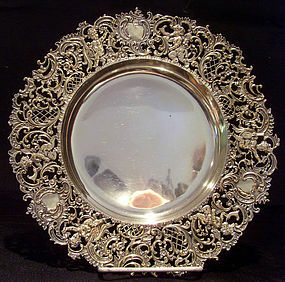 It is sogned Howard & Co. sterling and measures 1" tall x 9 1/2" diameter and is in perfect condition. This is a lovely hanging fixture, circa 1920's done in caramel and blue slag glass and decorated with metal birds on the border. 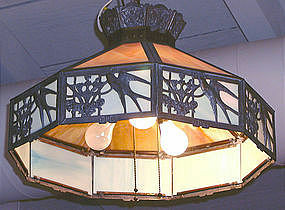 It is in perfect condition, and measures approximately 22" diameter x 14" to top without chain. 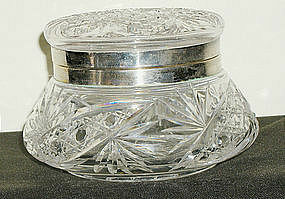 Brilliant Cut Glass Hinged Box - This box, all original, is a very unusual size, as the glass lid is considerable smaller than the jar itself. I don't know patterns, and it is not signed, but I do know that its quite lovely, the top matches the bottom, and its in perfect condition. 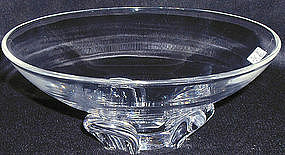 It measures 4 1/4" tall x 5" diameter on the top and 6" diameter on the bottom. This is one of the Steuben animals that I have never seen before. Measuring 5" high, he was introduced in 1974, and I don't know when he was discontinued, but I know he isn't available anymore. He is in perfect condition. It is Steuben number 8293. 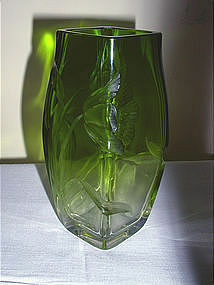 This is a very deep green to clear Moser vase with beautiful intaglio flowers etched on sides and into the corners. It measures 5 1/4" tall x 2" across. It is in mint condition. This box, although not signed, appears to be done by DeVez. 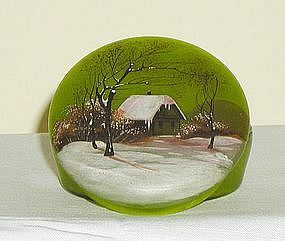 It has a lovely sceic enamel top of a house in the snow It also is decorated on the sides, and measures 2 1/2" tall x 3 1/2" wide. It is in perfect condition. 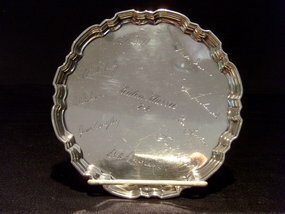 This is a sterling plate made by Tiffany which was autographed by the players in the Keaton Golf Klassic in 1974. It is signed in the silver by Art Bell, Hale Irwin, Don Fisterwald, Gene Littler, Lionel Hebert, Dale Douglas, Jim Langley, Charles Coody, and Bob (I couldn't read his last name). It is marked on the back Tiffany & Co., Makers, Sterling Silver, 23336. There are scratches to the silver, but the autographs are all readable. The plate has a diameter of 6". 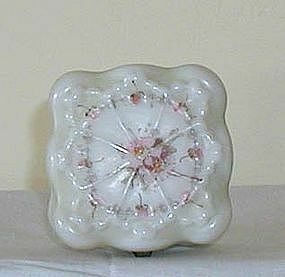 Signed, hinged, Wavecrest box in the eggcrate design with original lined interior; perfect condition; top with floral design; 3" wide x 2 1/4" tall. Small Steuben Glass Sugar & Creamer - Lovely signed Steuben sugar and creamer, the sugar measuring 2 1/2" tall x 3" wide, the creamer measuring 5" tall x 3" wide, both in perfect condition. 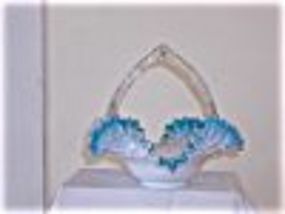 Lovely signed Steuben bowl measuring 3" tall x 8" wide, in perfect condition. Lovely signed Steuben sugar and creamer, the sugar measuring 2 1/2" tall x 3" wide, the creamer measuring 5" tall x 3" wide, both in perfect condition. 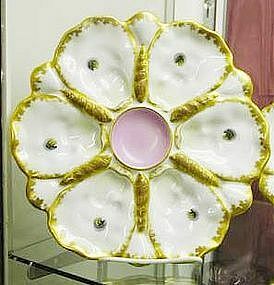 Lovely continental porcelain oyster plates in three different colors; each in perfect condition; measures 9 1/2" diameter; one with pink center, one with blue center, and one with teal center; only markings on back are a raised star. This started out as a set of 12, and I have several left in stock. 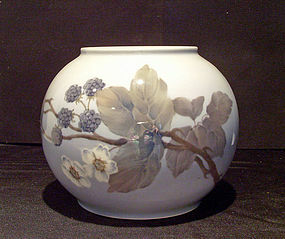 Lovely Royal Copenhagen vase with blacberries. 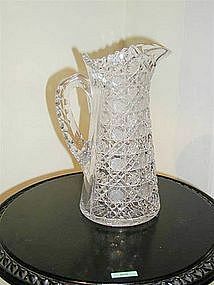 This vase is in perfect condition with no chips, cracks or repairs. 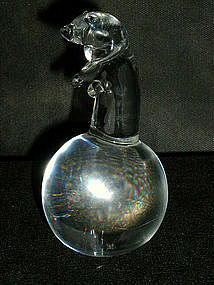 It measures 6" tall x 7" diameter. Probably the most popular of all Steuben vases, this was designed in 1949 by George Thompson and is still being sold today. It measures 5" tall and is in perfect condition. It is Steuben number 7985. There are two of these vases, and the price show is for each one.